Childhood can be a magical and innocent time oblivious to political regimes and problems. And that’s what these twelve nostalgic short stories strive to convey. Most books about Russia and the Soviet Union focus on discussion of politics, stories of food shortages, or lack of democratic freedoms in red Russia. 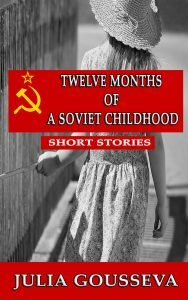 This collection of short stories portrays everyday experiences of a young girl growing up in the Soviet Union of the 1970’s: before the break-up of the socialist block, before Putin, and before the day when the red flag of the Soviet Union became history. This book of short childhood memories takes the readers on a journey of a year in the life of a Russian girl. Each story recounts a memorable experience of each month of the year, and each month becomes a story of its own. The short stories in this book reverberate with the deep bonds of family as the readers get to know an unforgettable cast of characters. For Julia and her cousin Dmitry, the story of January starts in the very center of red Russia, in the Kremlin, as the two of them make their way to children’s party in the Red Square. The party is exciting but an unexpected turn of events leaves the adults worried and wondering. There’s Uncle Gena, a nuclear physicist, a mountain climber, an artist, and an adult who managed to remain a child at heart and who sees beauty all around him and finds lyrical music in unlikely places. Babushka, a typical Russian grandmother, is an important character in this book and in the life of her granddaughter. She’s taking care of children, of her beloved red roses, and is proper in all respects. Thus, when the two little girls in her care end up in a precarious situation in the middle of Gorky Park, babushka has to compose herself before taking decisive action. Summer months, with their short nights and long days, are a time for vacation at the dacha and for encounters with unusual animals, people, and plants: from babushka’s red roses and the mysterious thief to a tree stump that produces mushrooms to the drama with a little hedgehog, summer is full of excitement. Of course, summer is always too short, but the fall brings its own stories: the beginning of school, new games, the drama of house repairs, and then winter holidays. December days are short and gloomy in Russia, and people find solace in decorating and celebrating.